1. 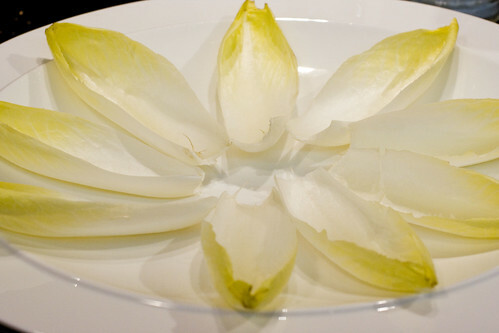 Arrange endive on a serving platter. 2. In a medium saute pan heat sausage and onion on medium high heat. Stir around until sausage releases fat. Add crushed red pepper and toss around until sausage has softened. 3. Add shrimp and cook until almost pink. Flambe using tequila. 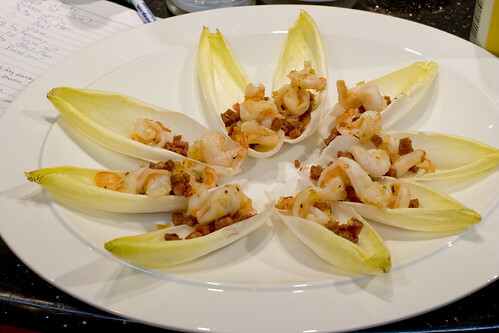 Toss and spoon onto endive leaves. Serve immediately. posted by jessica	at 08:03 AM	Filed under Fusion, Recipes. You can follow any responses to this entry through the RSS 2.0 feed. Both comments and pings are currently closed. MMMMMM…….This looks so lovely & yummie : I think this is a great appetizer!!! It’s like they each have a little boat to hang out in. 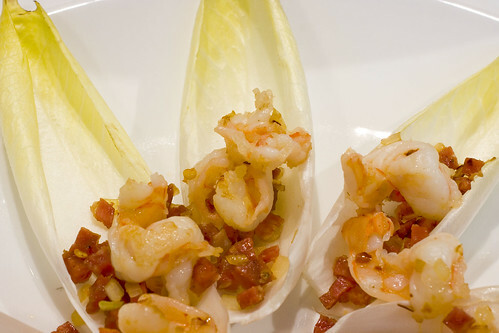 Using endive leaves to fill for an appetizer is such a perfect idea. I did mine with grapefruit, avocado and mint leaves with a vinaigrette, or a pear, walnut blue cheese. I love the idea of the shrimp. I am going to try this version. Manger, That reminds me of a salad I did in endive for Jessica last year. Do you have pics of your salad?